reinventing | tales of an INTJ school librarian. Meaningful Play – and reading! – at the Strong. So I spent Monday through Thursday of the previous week in class. 9AM to 5PM, with occasional coffee refill breaks (you know how I am about my coffee) and of course time for lunch (you know how I am about eating). But IST 612, alternatively known as Youth Services, was a great class. Can’t underscore that enough. I absolutely loved it minus the parts where I was slightly overwhelmed and I learned entirely too much for my brain to comprehend in 4 days. So, my new perspectives, ideas, thoughts, and creative quirks have spilled over into real life. Ack! I spent the weekend decompressing and continuing to caffeinate in Rochester, a city that’s right down the thruway/canal. May as well explore while I’m living in Upstate! So, Friday late afternoon, I found myself at the The Strong. If you glance at their website, you’ll discover that The Strong incorporates several different facets of life and fun and museum-ish things. The National Museum of Play! Now, in my I need to decompress immediately before my brain collapses state on Friday, I chose to focus most on the National Museum of Play because…well… play. That sounded fun. And it WAS. I sat on the stoop at 123 Sesame Street. I read children’s books. I built towers of blocks. I drove a stunt racecar using my hands with an XBox Kinect. I organized a laser light show. I tried on superhero capes. I played an electronic harp in the Giant’s kingdom. I discovered a secret door in the Mystery Mansion. I walked through a tilted room to see perspectives change. I saw the Lorax in person! 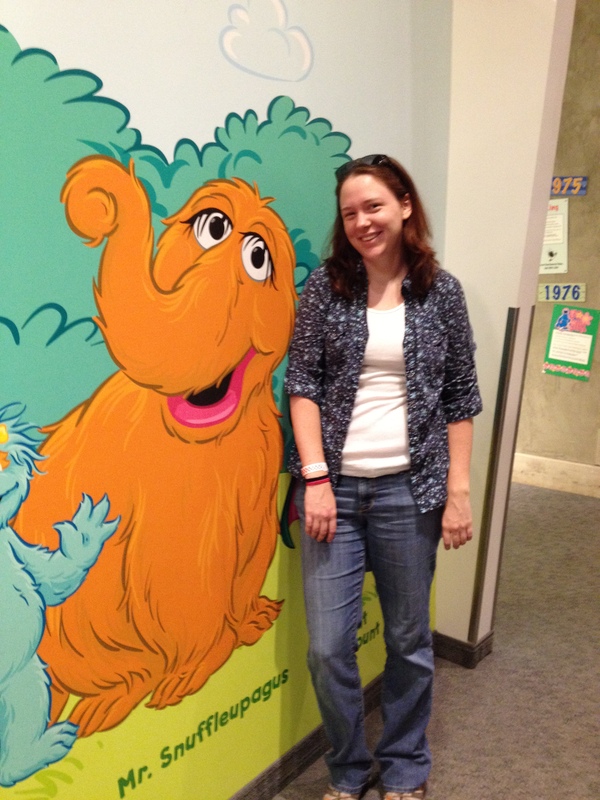 Proof that I am taller than Mr. Snuffleupagus. He’s tanner though. If orange is considered tan. Is it? Short summary: I had a lot of fun. But I learned stuff, too. Which is even more fun. (That’s just how I roll.) But there’s something else that, as a newly-escaped-from-intensive-class-school-media-student, I appreciated all the more. The public library system of Monroe County has an entire collection at the Strong. The books are located throughout the museum – expect to find graphic novels in the superhero section, and primary-age books on color and letters and numbers in the Sesame Street section, and books of all shapes, sizes, and silliness in the ‘reading adventureland’ section. Kids who don’t have a library card can sign up for one – right there inside the museum – and take books home. Then they can be returned to any library in the whole county system! For those who return often, there’s a book drop at the entrance to the museum. While I won’t spend enough time giving this idea justice… think about it for a moment. How awesome is that, as an example of how to reach your community? Parents accompany kids to the museum – especially if they’re younger kids – and now, they can combine their fun trip to play with a trip to the library. No extra car seat wrangling involved. I love it. And it made me quite happy to see it. And my poor boyfriend had to hear about how much I loved it, in between me trying on superhero capes and trying to make them swirl through the air dramatically, so I figured I’d blog it out of my system so I can stop talking about it. What do you think? Crashing a conference, #HEWebSYR style. Summary: I had no idea what would happen. A conference of smart people was happening feet away from me. Image of HighEdWeb Syracuse logo shamelessly taken straight from the event website at http://ny.highedweb.org/. Jill wins SO many points from me for putting an attributing link for every Flickr image used on her slides. YES. If you’re making a higher-ed website, consult XKCD first. Obviously. Not everyone wants apps, especially people who don’t have app-centric devices. Even people WITH those devices admit to often using the web function instead. Students are already talking about your school. Don’t be afraid to ask them to continue to do so. Undergraduate students might not mind being paid in pizza. This graduate student probably wouldn’t – it would just mean more time at the gym. Nothx. If your philosophy sees accessibility as something “that needs to be fixed” in the system… you might want to reconsider your philosophy before you “fix” the system. Everyone loves old school, black-and-yellow Tweetdeck. Everyone. People who write code are really, really smart. But they know how to talk to us non-coders. Quite the skill. And that’s just the highlights. You can read through the pretty-active hashtag for the event, #hewebsyr, to catch more thoughts from more people. Thanks for the fun, conference attendees and speakers! Smile. Chat. Admit You Don’t Know Everything. But really, I’ve been terrible about blogging about my library school experience. My apologies. I’m not going to bother taking the time to rehash the semester; perhaps I’ll do that in a series of posts over the next few weeks. Instead, I’m going to take this time to discuss some interactions I’ve had with both librarians and libraries – note, those are not the same thing. Bear with me, if you please. I needed to have a form signed in the presence of a public notary. I’ve only been in NY about 10 months, and haven’t had to deal with this before, so I was at a bit of a loss as to where to find one – preferably at no cost to myself. In Ohio, we had about 7 notaries on staff at my library branch, so I immediately think “yes! the library”. I call my ‘home branch’ here in NY, which we’ll call… HomeLib. On the phone, I am informed that HomeLib does not have any notaries on staff, but OtherLib does. OtherLib is a fairly sizeable library, in a relatively economically stable part of the greater CNY area. It’s out of my way to go to OtherLib, but I figure I’ll just factor it into my commute home. So, on the way home from a long day at work, I go to OtherLib. It was this line that gave me pause. Now, a few weeks removed from the situation, I can deal with it. But here’s a customer/patron/user/member who is asking for a service, and asking to be informed when that service might be available, and the response is “ask us again when the service will be available”. Perhaps I shouldn’t assume such things, but since OtherLib knows the individual staff members that are notaries, and considering their schedule has to be somewhat set in stone in order to properly staff OtherLib each day of the week, somewhere it must be known that “Notary 1 is here tomorrow until 4. Notary 2 is here Thursday in the evening hours.” I don’t think it’s completely outside the box and overwhelming to take a moment and locate that information and share it with a patron. However… I’ll let it stand. The bigger problem was the attitude encountered, which is impossible to convey here, other than “Stop asking questions; I know better/more than you.” Now, as an INTJ, I’m unlikely to adopt this attitude well. As a librarian-in-training and former public library employee, I’m tempted to out myself just to see the reaction. We’re moving on from this story. Moral: you’re not above your customers/patrons/users/members. I think most librarians I know embrace this fully. Yesterday, a number of people involved in the library/information profession in some way were visiting my place of employment (the iSchool). As shocking as it may be to some, the I in INTJ doesn’t mean “standoffish in the corner”. While I am, at heart, an introvert, I love conversations and chatting with random strangers. I introduced myself to a trio of older gentlemen yesterday. I knew 2 of them by name and association. The third I did not. However, within 90 seconds of conversation, I stated my ultimate goal of being a “rockstar school librarian” – my catchphrase – and was informed by Unidentified Gentlemen that he was most certain that I would, someday, achieve such status. Now that is something I’d like to hear more often. We libraryschool students thrive on being told by others in our field that we’re going to go accomplish great things. Trust me. Another conference attendee that I interacted with had a short exchange with me that truly summed up why we do what we do. If I didn’t, on some level, want to genuinely help people in whatever ways I can, I wouldn’t be in this field. I won a book on Facebook today. My HomeLib in Ohio posted a trivia question from their Facebook account, and stated that the first person to answer correctly would win a copy of a children’s book. I, having just logged in at that particular moment, jumped on it and managed to win a copy of a Scooby Doo book. (My nephew will be the direct beneficiary of my actions this morning). I hope the library system continues to engage their public with such contests. A great follow-up would be “didn’t win a copy of AmazingBookX today? Here are the branches that currently have copies. Here’s a link to the catalog. Ask us for help in requesting a copy!” or something to that effect. Which brings me to my concluding point (you didn’t think it would ever end, did you?) — relationship marketing. Figure it out. Read up on it. I highly recommend “The Thank You Economy” by Gary Vaynerchuk. Get it from the library; buy yourself a copy; borrow it; do what you need. But… grasp the concept. And then run with it. Start making relationships. SMILE at people. Seem genuinely concerned for their well-being – and BE genuinely concerned with their well-being. reinventing: not a bad idea. It’s 3:11 in the morning and I’m creating a new blog post. Because sometimes inspiration strikes, and the best thing to do is acknowledge it so that you can work past it. My oldest brother has held more than 30 jobs in his life. Continually seeking the next good thing. My next brother went from being a college drop-out to a sergeant in military intelligence. Now he works as a citizen for a federal intelligence agency, and is such a proud dad and husband that it gives me hope for the world. My next brother (ed’s note: yes, I have three) went from being a soldier – the path he’d always envisioned himself on – to being a war veteran who now works what most would consider a minimum-wage job so that he can solely afford to travel and adventure. He sends me pictures of the wild animals he encounters – last ones I got were of a herd of elk. My sister, known as the music and drama queen of the family, went on to become a therapist and works with severely disabled clients. It’s a good day at work when she can say someone actually improved a skill, and yet every day she trucks off with a bit of optimism in the tank. I graduated high school (ed’s note: in a small town in Ohio!) and headed off to college. Everyone knew my path: get a degree in chemistry, take over the world, in that order of course. Within a year, I’d had numerous career-counseling sessions, declared an abhorrence for laboratory work, though I loved the theoretical, and switched my major to history. History, the field that most consider “the study of the past with lots of memorization of names and dates.” Three years later I graduated with a BA in history and approximately zero plans to pursue a career path specifically linked to that field. Now, here I am. In a new state, at a new school, with new professors and a new path. I’ve reinvented myself yet again. From chemist to confused to historian to student all over again, with the hopes of going on to the librarian path. And how does any of this (minus the last clause of the last sentence) apply to school? As a field, librarianship is continually changing. Like we mentioned with medicine, it didn’t go out of style and fail to exist simply because of germ theory. The field took itself where it needed to go, established itself as relevant yet again, and flourished. Librarianship has been doing the same thing over the ages. While we may have originally been the hunchbacked scribes, creating transcripts and storing them in a logical order, we are now ‘information professionals’. We are people with answers, and people willing to take the necessary steps to procure an answer. We have reinvented ourselves and maintained our relevancy through yet another age. We’re learning how to be ‘new librarians’ and excited to take what we’ve learned into the field to continue to shape it, mold it, and reinvent it, for the modern day. But medicine didn’t continue because doctors decided to catch up to germ theory and figure it out. They didn’t decide to start developing pharmaceuticals because it was a way to make money off a disease (not starting a political discussion here, just roll with me). They successfully integrated their knowledge, the information at their fingertips, their willingness to serve, and their tangible goods, and created modern medicine. One would not consider going to a doctor who announced he only served, but would not dole out a physical drug to treat an ailment. Likewise one would be hesitant to approach a physician who claimed to write prescriptions, but was unwilling to listen to your list of symptoms and diagnose you first. In the same way, we as librarians must take up the challenge of integrating our willingness to serve the public with information, and the goods we have at our disposal with which to do so. We can learn from the past. We can witness the present and all that we’re doing right. But we must also look to the future – to spy that which has not yet come over the horizon – to perceive that which is still as yet indiscernible – and be prepared to reinvent ourselves. Constant vigilance, my friends! The future is ours, should we bolster ourselves with just enough confidence to continue offering goodly service and servicely goods to those who seek them.